With the amount of female motorcycle owners increasingly on the rise, Get On by Janet Green comes just in time. 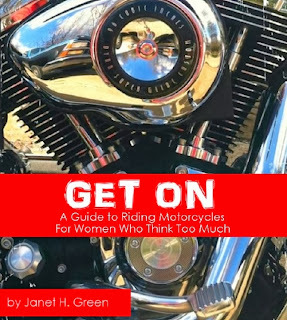 Get On: A Guide to Riding Motorcycles for Women Who Think Too Much, is a humorous but honest look at the questions women face when considering whether to ride. It launched October 24 as an e-book available on Amazon.com, and as a direct-download. Women who think they may want to learn to ride a motorcycle, but are stalled by unanswered questions, now have a new resource to help them get past the what's, why's, how's, who's and where's of riding. Janet Green, who has been riding since 2002 and blogging about her moto-adventures for almost ten years, has published a new e-book for women hoping to enter the world of riding their own motorcycles. "Women are increasingly willing to take the risks involved in riding, but I think they take more time calculating the risk," Green says. "They spend a lot of time thinking through how their decision may affect others, what dangers they face, and how best to 'go about' learning to ride. It leads to an informed decision, but it can also prevent them from getting started at all." Get On is meant to be the nudge they need, Green says, to make their decision. Who's going to ride with me? What's a good bike for a beginner? Where do I go if I still have questions even after I've got my license?" "The book was all I'd hoped it would be: instructive, informative, authoritative (but not overbearing) and amusing... Love the book and what it stands for," states another. Read an excerpt of GET ON here or order the Amazon Kindle Edition here. Visit Janet's site for a PDF or .epub file here. "Get On" is not Janet's first foray into motorcycle publishing. As a lifelong resident of Des Moines, Iowa, she has published articles in various motorcycle magazines including Throttler, Thunder Roads Iowa, and HOG Africa. She began riding in 2002 at the age of 40, and began publishing her blog Biker Chick News in 2004.